If you’re considering working with HP Latex print technology — or if you’ve purchased a latex printer that you’d like to get more use out of — you’ve clicked on the right blog. Let’s take a look at how HP Latex technology can help you improve production times, save money on consumables and offer more products to your customers. Save Money: While your initial investment on equipment may be higher than other print technologies, the cost of consumables such as ink and media are quite a bit lower. In fact, latex ink costs are nearly half the price of aqueous inks. Media, such as banner material, can cost 10-30% less than aqueous versions, depending on the material. Those overall, long-term savings are significant. 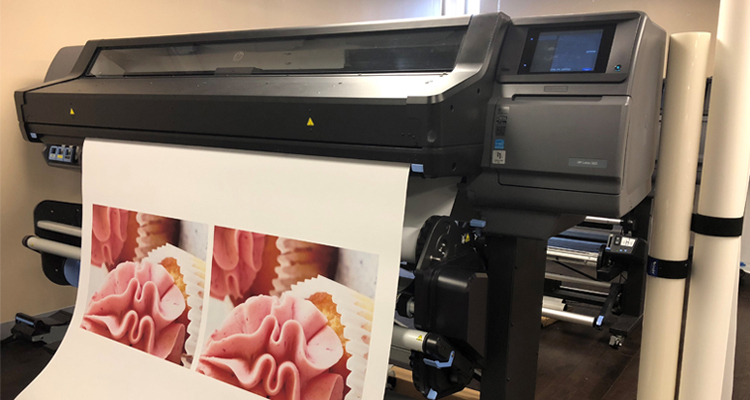 Improve Workflow: When an HP Latex printer is installed in your facility, a tech will spend time with your team providing operation instruction, so the learning curve is quick and easy. Once in production, since latex inks don’t need to be coated, you’ll save the time and expense that come into play with coating canvas, for instance. With latex, there’s no need to add a protective coating, so just select a roll of gloss canvas, print, stretch and go — all within the same day! Plus, the durable latex inks are fade- and scratch-resistant and can last up to five years without a protective coating or laminate. Offer More Solutions: This may be the biggest opportunity for print service providers. With latex, you can expand your offerings into all the major digital print market segments, including fine art and photo reproduction, canvas wraps, indoor and outdoor signage, trade show graphics, adhesive vinyls for a multitude of applications, and the exploding specialty décor market. More and more materials are currently being manufactured for latex production, including fabrics and wallcoverings. The Latex Difference: When using HP Latex-certified materials, you are ensured that not only will you get accurate, consistent results, but in many cases you’ll be able to offer your customers products that have been verified for environmental and human health safety, which you cannot achieve with solvent technology, for instance. Often, hospitals, hotels, schools and corporations look for these verifications and certificates to help them achieve LEED certification for their buildings. You can make a big difference in helping them reach this goal! Last year, HP introduced its Latex Print & Cut bundle, pairing latex printers and top-of-the-line cutters. Check out the video below to learn about the applications you can produce, like stickers, decals or vehicle graphics, and how they stack up to the competition. To discover all the HP Latex printer options, please visit LexJet.com and call a LexJet print specialist at 800-453-9538 today.